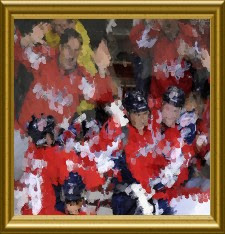 The Washington Capitals defeated the Nashville Predators on Tuesday night at Verizon center in Mike Knuble's 1,000th game as an NHL player. The Caps offense struggled to get off shots at times but were saved by the big three, with Ovi, Nick, & Semin all scoring goals on the night. Neuvirth helped seal the victory with a solid night of goaltending much to the approval of the Verizon Center crowd. The pregame started with a mini-ceremony with video celebrating Mike Knubles career. A video covering highlights from only 180 out of 1,000 games played. Who cares about the other 820 games in a 1,000 game retrospective! During the ceremony Knuble was given presents too. A Jetski, a tiffany crystal, and a silver hockey stick. The Caps started the game with the Knuble momentum and at the opening drop the fans were amped. The Caps as they have done all year got lucky with the other team again. Pekke Rinne who played goal like a brick wall last time these two teams met was not used by the Preds. Rinne was hot too, winning 5 straight contests and giving up only 2 GAA in those games. The Caps played the first period like the good old Caps. Hitting hard and attacking. Marjo started on the first line in place of Ovi but Alex starting the game with some big hits. Around 8 minutes in, the Caps started what looked like a sloppy break but Ovi did a kind of backdoor move and Alzner fired a long pass to give him a one on one break. A little move and the puck was in the net. The Ovechcam in the 1st period! 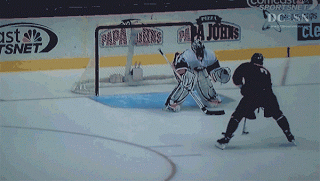 Backstrom came back later in the period with an NHL 94 wrap around move for a 2-0 lead. Don't get excited yet Caps fans, that was just 1 period of action. In the 2nd period the Caps only shot the puck 3 times. The Caps escaped unscathed however thanks to the PK preventing the Preds from getting any shot attempts on two separate powerplays.. Meanwhile, Neuvy had 2 good close saves on wrap arounds and a few other nice stops as well. With under 3 minutes left in the period, Chimera got knocked down and demanded retribution. First he attempted to smash the guy's ankles with a slash, but missed. So he got up, went over, and smashed the guy with a cross check giving Nashville a chance. Luckily for the Caps it was one of the shotless variety described above and the score remained 2-0 headed into the 3rd. The 3rd period started off with a Predators goal in the first 5 minutes of action by Sergei Kostitsyn. In the 20 minutes before that goal a graphic on Comcast showed the Caps only attempted one shot. However, when the Preds were looking like they were going to tie the game, the offense came back alive. Marjo came down the ice, dropped a pass back to Alex Semin, and he fired an amazing shot top shelf past the goalie. Later in the period Wideman fired a powerplay shot that deflected off of Brouwer for the dagger. The Caps finish the game with 4 goals on 23 shots (17% / 83%) not gonna happen every night. The Caps can win games and score goals if they play like they did in the first period...but they have to keep it up the whole game. I mean 3 shots in the 2nd period? That is pathetic. If we erase the 2nd period however, and the first 5 minutes of the 3rd, then we have a good hockey game. Neuvirth earned himself another start. Mike Knuble's highlights from his 1,000th game all came before the contest began. Knoobz played under 10 minutes of hockey and had goose eggs across the stat sheet. Goals for Ovi, Backstrom, & Semin. HELLO. FINALLY! Late in the period Semin boarded Tootoo which Locker thinks may be reviewed by the NHL. 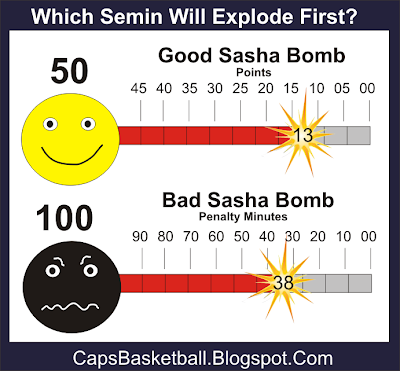 Kind of a scary moment for a second and a great moment for the Bad Sasha meter! If the Preds coach is an evil henchman then the Tampa Bay Lighting's coach is the mastermind.